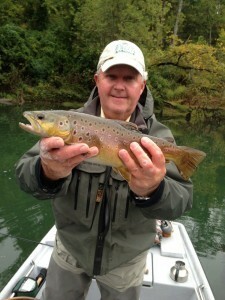 We got a chance to do a little fly fishing this morning with a couple of good friends, George Born and Ron Phillips. 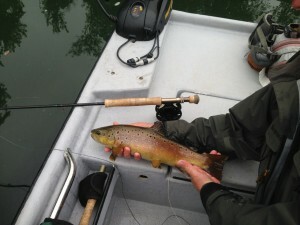 It was a cloudy, misty, cool morning and the Brown Trout are really starting to get active. Bo drilled these two beautiful fish on his favorite streamer, the Chuck’s Chunk. There were also a good number of Rainbows and one little Chained Pickerel taken on streamers before the light got too bright. Later in the morning several different #16 sowbugs continued to produce good numbers of fish. The river is in great shape as the fall fly fishing is moving into full swing and the leaves are just beginning to change. It is going to be a beautiful fall season so if you would like to enjoy some great fly fishing just book a trip with us at Empty Creel Fly Fishing Guides and Outfitter.